This year, each of our over 400 students at our school received an Ipad to use at school. This adventure was something my Encore coworkers were ready for. Our Encore is made up of our PE, Art, Music, Media, and Science Specialists! It wasn't an easy start, but we had to figure out what programs we could use, lessons we would need to teach (we had some regular ed. classroom teachers not ready to dive in to allow the students to utilize the Ipads in their own rooms let alone the specialists' rooms) so we worked as an ENCORE team to help everyone! 1. How can we use Explain Everything in and out of the classroom? 2. Is there a way to make the Ipads replace some of my many science worksheets? 3. How can we easily upload those images so that the students don't have to? Our amazing Media Specialist started with teaching lessons on the apps that we chose to focus one...most importantly Explain Everything so that we could create folders for each one of us. To deal with the second goal on my list, I wanted to find a way to use the Ipads for assessment, uploading worksheets, and go more paperless. In the last few weeks of this quarter, I am now savvy enough to make some fun, interactive activities that work along with our FOSS kits. Where some people use Chrome Books or laptops and can have movable parts in their activities, I have learned that with Ipads that doesn't work. What can we do with our Ipads? 1. I can Airdrop all sheets that I save as a JPEG/PNG to the students! -Chose one of the options (off, contacts, everyone) I always choose everyone when I airdrop to my students. Your students will now need to accept the photos by pressing the accept button. Now that they have the photos that I airdrop...it's time to upload those pictures. Some of my friends use PicCollage which is a great free app that could be used instead of Explain Everything. 3. They can then open up Explain Everything, go to + button, go to the top add a photo (we say go to the mountains). 4. They need to now go to see the rainbow on the mountain (okay the photo key) Here they will see the pictures that were airdropped. Have them pick the one that they want to add to their page. Once it is picked, they will need to press the bottom corner DONE button. The picture will now be there for them to use. Often I have the older students lock in the background. 5. If students want to lock in the background, we go to the i with the dots around it. I say, "Press the I...I want to ...now touch the picture...want this picture....now press the set as background...I want this picture as background...I want this picture...touch the picture again... and say to work with while you press the finger at the top. Check out what we are doing to integrate technology! 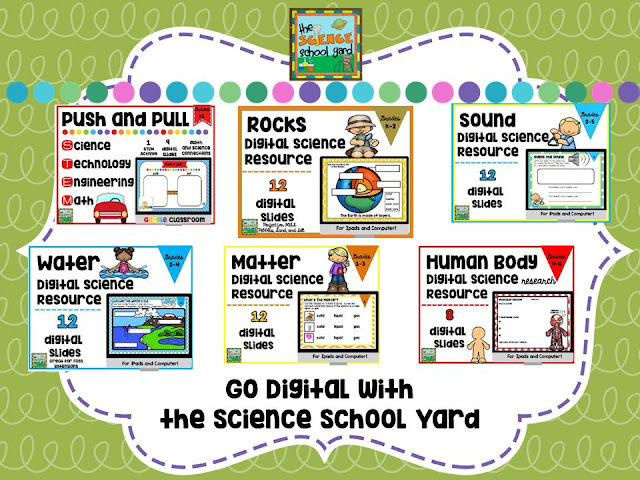 Find Digital Science Resources HERE! Want to try it out first? Here is a JPEG for you to upload to your iPads using the directions above to see it in action! 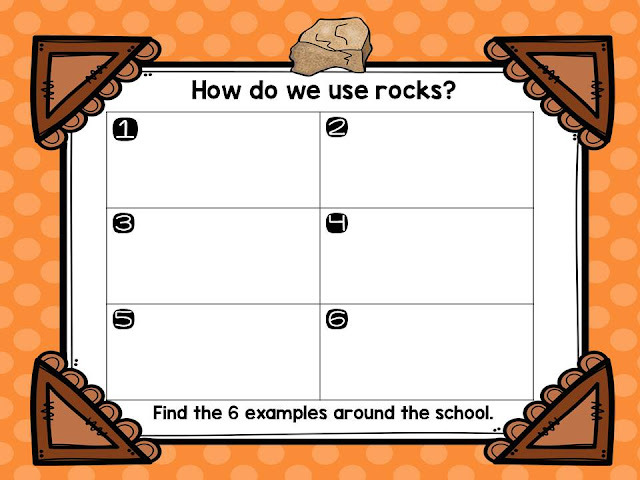 I used this with my first graders for our rock unit. We did a "How do we use rocks?" scavenger hunt around the school. We inserted pictures into each box to share how we use rocks in our school! They loved it! You can see one of my firsties using it above! Let me know how it goes! Digital Science Lessons are a great way to add engagement to your school day in a whole new way!